As we have seen that the Kindle Fire has proved to be quite a successful tablet after it got released in the market. Now it has also been revealed that they have been busy with upgrading the device as well to cope up with the changing technologies, as Amazon has just released latest version 6.3 software update. Sharing – With this update the customers will be able to easily share favorite passages and note of their books directly from Kindle Fire. They can simply highlight the passage they want to share or choose the Share option from the toolbar within a book, write a note, which they can choose and share it on a social network as well. Book Extras- With this application the customers will be able to see supplementary material about the books they are reading without leaving the book. This feature is powered by Shelfari, Amazon’s community of book lovers. They can even view descriptions of characters, a glossary of common term or even information on the authors. Print Replica Textbooks - Students can now buy textbooks on their Kindle Fire and save up to 60 % off the price from the printed books. Archive of personal Documents- Now the personal Documents will be stored in Amazon cloud and available for re-download at any time on the Kindle Fire. Reading View for Amazon Silk- with the reading view on Silk, the contents that the users are interested in is elevated above the clutter, while reading any article on the internet. The Silk will only load the body of the page in a reading optimized, single screen view. Movie Rentals – the rental period for the movies now starts only after playing the movies rather than from starting point of downloading the movie. 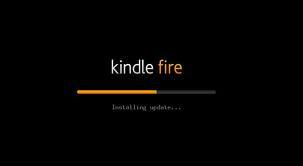 Apart from all these this update will also bring some other features for the consumers which includes faster re-connect by Wi-Fi after Kindle Fire has been asleep along with some other general performance enhancements.